By planting a garden, you can have a tremendous impact on our world. When you incorporate even a few native plants, you create a much-needed haven for wildlife, especially birds and butterflies. Bees, butterflies and bugs all play an important role in fruit and vegetable production as well as charm us with their beauty and grace. Bats consume an amazing amount of mosquitoes and harmful insects each night. Birds fascinate us with their winged acrobatics and beautiful songs. How you design your garden can impact how water moves through your property. A rain garden that holds and filters water can attract a wonderful variety of birds and insects. Creating a wildlife-friendly garden can be a wonderful project for adults and children. As you are planning your gardens this summer, think about expanding a bed, adding a native plant or reducing pesticide and herbicide use to encourage preserving a piece of our natural world. Every little bit helps! We’ve designed the classes on June 15 to give you ideas on how to incorporate natives that are easy to maintain and well-behaved. Check out the beginnings of our new demonstration garden in Aurora between the front parking lots. We’re excited to be developing a new garden area and encouraging even more beneficial birds, butterflies, and bugs. Join us for a walk around the grounds of our Aurora location and spot some of the many varieties of birds that flock to our gardens. Bring your binoculars and, if you have one, a bird book. 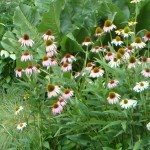 Learn how to weave a sampling of native plants into your gardens that pay big benefits in color, texture and low maintenance . Using basic design principals, we’ll discuss how to incorporate natives into a typical suburban yard. Find out which plants, including natives attract specific songbirds. We’ll also discuss plants and design tips for successful butterfly gardening. We’ll introduce you to plants that do not mind wet or dry situations (gardens that are wet after rains but also dry in summer). Many native plants have adapted to these conditions as well as hybrids. We’ll explore how and where to place these plants so you can enjoy four-season interest without fighting your site. Attendees will receive a $10 coupon towards a plant purchase. Registration is recommended. Call 630-355-4000. Limit 40.